I am using Blogger for this website, which is a free service, so it may be that my criticism of the new Google News service is a case of biting the hand that feeds me, but I had to say that I find the new redesign is total crap. Not a very episcopal expression, I know, but it summarizes the situation well. Additional tests show that the search engine simply gives bad responses. I searched for information on "Cardinal Müller", as there is news trending about him as I write this, and when I clicked on the link to "View full coverage", everything was about another Australian cardinal who has been in the news lately. Useless. Sorry, Google, you screwed this one up. Time for a reversion to what, you know, actually worked. I got my most recent report cards from the Institut de droit canonique in Strasbourg, where I have been a distance student for the past 7 years. They confirmed the good news that I passed my final paper, which means the only thing left to do is the thesis. Good thing I have a clear topic, and the general outline is already done. Really, all I have to do is 60 pages of fill in the blanks, i.e. yikes! 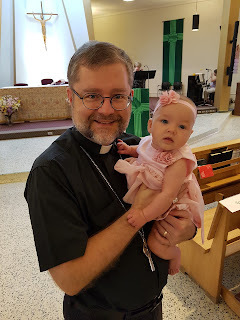 I started this journey a year before I was made a bishop, and when that new reality came along I figured it was a sign from God to drop out and focus on other things. When I would pray about it, though, I kept getting a very clear signal that the Lord wanted me to keep going, even if it would take longer. The Institut de droit canonique was really good with me too, offering me lots of extensions along the way. It has been a fantastic learning experience, and one which has already been of service to the Church in ways I did not expect. Of course, it has also been a lot of work too. I'm sure every student has, at some point, felt the temptation to procrastinate, or needed a push to break through writers block. I'm all set up to use July as a month of writing -- in addition to the new laptop and reference materials, I've got my brain food (i.e. snacks) and study music (you wouldn't believe it if I told you) ready to go. But your prayers would be appreciated as well! 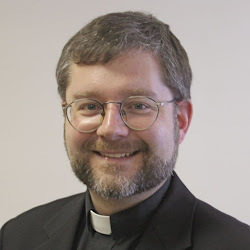 I know that there is a great deal of discussion going on right now regarding whether or not people living in certain marital situations should receive Eucharistic communion. Part of my job as a bishop is to provide a measure of clarity through answers to such questions. This isn't always easy, especially when certain particular situations are especially messy. Still, sometimes the answers are easier, and I am happy to oblige. For example, one common misconception is that people who are civilly divorced are not allowed to receive communion in a Catholic church. The key word here is MISCONCEPTION. Simply put, there is no necessary link between being divorced and not being able to receive communion. No necessary link. None. I don't know where this misconception comes from, but sadly I know people who have suffered for years, feeling terribly (and unnecessarily) rejected. Now it is definitely true that spousal abandonment is a form of breaking of the marriage vows, and therefore has a sinful quality (although there are occasions that can justify initiating a separation in the couple, such as adultery and abuse). It is equally true that sometimes in a divorce there is a truly innocent party. Therefore, it is the act of unjust spousal abandonment that would prevent a person from receiving communion, and not the legal act of divorce per se. After all, it would not make sense for the Church to punish people who find themselves divorced who never went looking for it, or who came to it as a last resort in a difficult situation. Of course, people who are divorced often want to get remarried, and because the Catholic Church does not recognize that civil authorities have any power to dissolve valid marriages, this means they cannot get remarried in the Church (at least, not without some sort of authoritative intervention by the Church first, such as a declaration of nullity). Those who attempt marriage outside the Church definitely trigger the communion restriction. However, it is not actually because someone is divorced, but because they attempted a marriage that the Church does not recognize. Two Catholics who have never been married before who decide to elope and get married in Las Vegas by Elvis can't go to communion either afterwards, because they got married outside the Church. But for those who simply got a civil divorce (or even just a separation), and who are otherwise living the life of a single person without attempting a new marriage, there is no necessary reason for communion to be restricted. To be sure, there may be a lot of healing that is needed, including to mend a broken heart, but that is all the more reason to turn to God in the Eucharist and seek his strength. In the meantime, I once again repeat: there is no necessary link between being divorced and not being able to receive communion. Too many people have been misinformed in this matter by some sort of folk wisdom that is anything but wise. Let's be sure to be part of the solution, and not the problem, by helping people live free of any misplaced guilt in this domain. So I was walking down the street today (June 27) to get to a lunch appointment when a guy came up to me while I was waiting at a red light. 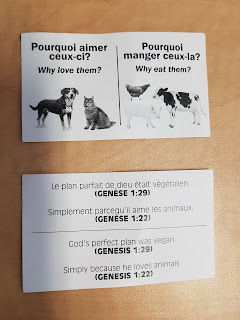 He handed me the above two cards, and then began to berate the Catholic Church for (in his view) not doing enough to protect the animals, despite Jesus having eliminated animal sacrifice. Such is life when you walk around downtown Montreal in a Roman collar -- similar to a box of chocolates, you just never know what you're gonna get. Coming back to my mystery interlocutor, after offering me his cards (as well as a piece of his mind) he took off in another direction. The whole exchange was less than 10 seconds, and as the light changed green I thought to myself, "Now I know what to blog about for today!" 2416 Animals are God's creatures. He surrounds them with his providential care. By their mere existence they bless him and give him glory. Thus men owe them kindness. We should recall the gentleness with which saints like St. Francis of Assisi or St. Philip Neri treated animals. I recognize that there are some who will object to some of these points because they affirm a special place for human beings within the animal kingdom (and indeed, within creation). However, that special status within the overall ecology of our world is definitely part of the Biblical perspective too (a subject for another blog post sometime). Within the religious practice of the Catholic Church, there is nothing that mandates harm to animals. For example, as the guy who handed me those cards pointed out, the tradition of animal sacrifices found throughout Hebrew history was not carried over to Christianity. On the flip side, our official book of blessings does have prayers for the blessing of animals. I even got asked to bless a dog in a veterinary hospital once (a neat story for another day). With regards to special diets, we know that many religions require their followers to follow such diets: kosher for Jews, halal for Muslims, various diets within Hinduism, etc. But for Catholics, there is no moral imperative in natural or divine law to eat certain foods or to avoid certain foods. The Torah does state that certain foods should not be eaten as they are ritually unclean, but the common Christian tradition says that Jesus declared all foods clean (Mark 7:19). The vision of Saint Peter as described in Acts 10:15-16 uses the fact of all foods being clean as analogy to enourage the inclusion of new peoples and cultures in the Church. While there is no moral imperative in natural or divine law to follow a specific diet, the Church does teach certain diets as part of the spiritual practice of penance. We are asked to avoid eating meat on certain days (Ash Wednesday and the Friday's of Lent, in particular), and to avoid eating more than one full meal on Ash Wednesday and Good Friday. Of course, this is just a minimum -- we can choose a more restricted diet if we wish. For the last couple of years, for example, I've followed a vegan diet during Lent, and I've gotten a lot out of the practice (a story for another time). I must confess, I did not get any vegan powers myself when I followed that diet during Lent, but that's probably because I took Sundays off :-) And before I hear protests, no that was not cheating. To avoid falling into the pridefulness a religious diet can encourage, the Church actually suggests certain days where we are called to feast, not fast! We even call them "feast days", as opposed to the aforementioned "fast days", and Sunday is the essential feast day, even during Lent. Coming back to the fellow who printed these cards, he is correct that the original plan of God described in the story of creation in the book of Genesis was, in fact, vegan. More than that, it was fruitarian, an even more strict form of veganism. However, we must remember that the story is highly symbolic in nature, and cannot be taken to be a simple outline of a plan of daily living. After all, Adam and Eve walked around naked too, and yet I don't think God is asking all of us to practice continuous nudism as a form of discipleship -- apart from the purely moral and aesthetic arguments against such a practice, it could get a bit chilly during a Canadian winter! Brrr! That's enough for now. I've already got enough material for three more blog posts on these and related subjects -- so stay tuned! Today, a meeting with Andy, a friend from university days! I attended Concordia University's budiness school from 1989 to 1992. I was super involved in student life, and my final year I was President of the Commerce and Administration Students Association (aka CASA). It was definitely one of the best (and most important) years in my life, and Andy was part of it through his involvement in student life as well. We reconnected recently at a gala fundraiser event for a local school. I must admit, it had been so long I didn't recognize Andy at first, but thankfully his memory is better than mine. We promised to reconnect, and although it took a while I messaged him when my schedule had an opening. What a great lunch we had! Part "good old days", part "what have you been up to", and part dreaming up new projects to change the world for the better. Thank you Andy. Looking forward to reconnecting! Yes, it's true: it has been 30 years since I graduated high school. I can hardly believe it! Our last reunion was 10 years ago (20th anniversary), so we were due for another. It was great seeing people I had not seen in so long, even if I couldn't stay long. And even if I went in my collar, it was nice to just be "Tom" for a little bit. My first three years of high school were somewhat meh, but my final two years were among the best of my life, especially the last year. Because we were all getting ready for college (called CEGEP here in Quebec) getting good grades (or heck, just graduating) meant that the academic pressure was on. Because my grades were pretty good I tutored lots of classmates my final year. I got a lot of personal benefits from that experience: I discovered a passion for explaining things, I made lots of friends, and in some cases I even earned a few dollars. But I also got a lot of satisfaction from seeing others succeed, and some of those stories came back to me. 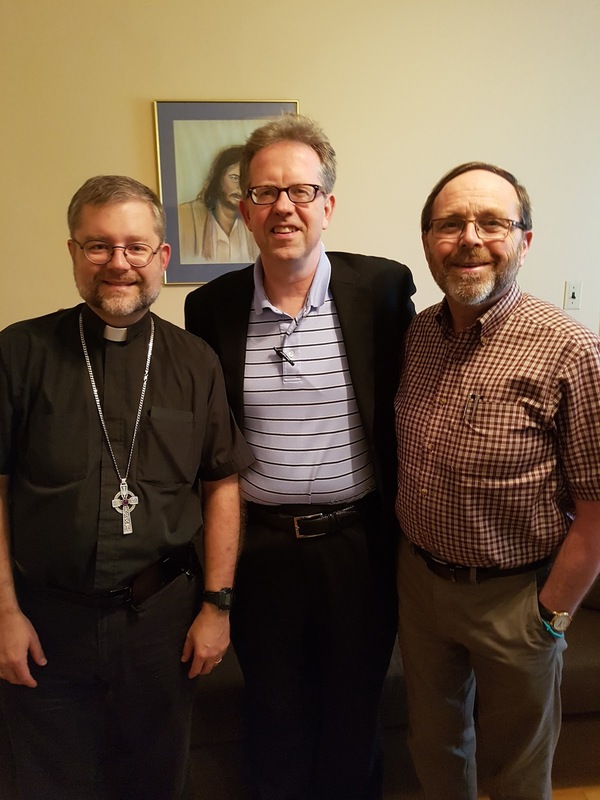 Who knows, maybe that was part of the genesis of my vocation to the priesthood -- seeing others flourish! 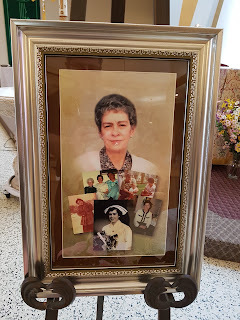 I was in Ottawa today (June 23) for the funeral of my aunt Louise (celebrated this morning). While a sad occasion it was good to connect with family. My cousins Paul and Patrick were there, as well as their extended family, such as little Ava, a most recent addition (she is my first cousin twice removed). 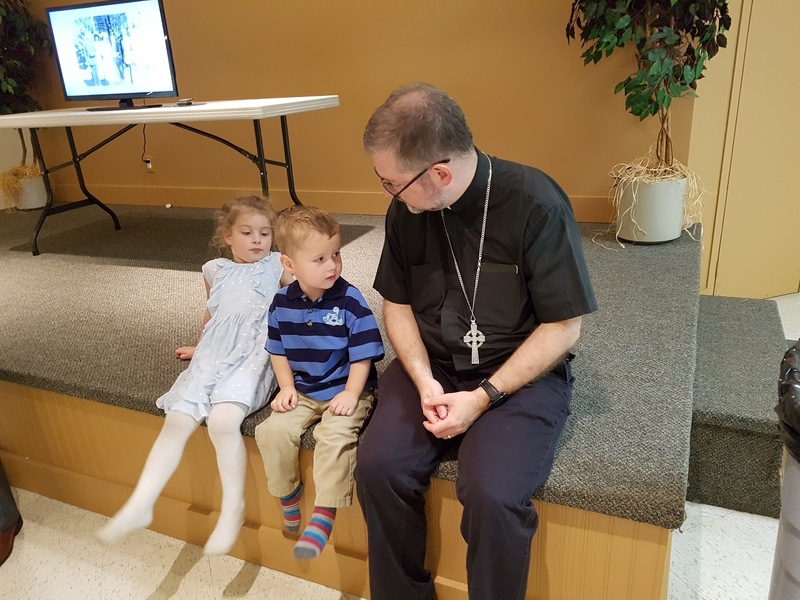 My mother, brother and sister were also there, along with my brother's oldest daughter Chloe, and my sister's three kids (including Brigid and Paxton, below). Paxton was especially adorable. I don't get to see him as much as I would like, so sometimes he plays strange with me, but not today. I sat down and he came over and plunked himself down right next to me. No special reason, he just wanted to be close. Again, adorable. I was a kid in a time before video on demand services like Netflix. Heck, it was before PVRs and even VCRs. We had one TV in the house, and if you wanted to know what was going on you consulted the newspaper or a print publication like TV Guide. Or, sometimes you'd be channel surfing and if you came across something you wanted to watch, you either just watched it or you let it go. I don't remember exactly how old I was when A Man for All Seasons came on TV. It was probably between the ages of 7 and 10. It was an afternoon, and I'm pretty sure it was a Saturday. In those days, Saturday morning was a time for kids to watch cartoons, but at a certain point the kids shows stopped and the "grown up" shows took over. My recollection is that I had finished watching "my" shows, and my dad had come downstairs to watch "his show". But as I was getting up to go, my dad invited me to stay and watch the movie with him. I wasn't too sure -- I generally found "grown up" shows boring. But my dad said, "This movie is about someone you are named after." Really? Wow! So I couldn't refuse. For those who do not know A Man for All Seasons, it is the story of Sir Thomas More (later known as Saint Thomas More). He was the good friend of King Henry VIII, and at one point was Chancellor of England. This was in the 16th century, when the Protestant Reformation was in full swing on the Continent. At one point Henry had himself declared the head of the Church in England, and communion disintegrated between himself and the Pope. Sir Thomas More could not accept to go down that path, and he eventually lost everything, including his life. At my age, I did not understand all that was going on in the story. It was set in another century, the dialogue was a fairly advanced form of English, and I knew very little about the Protestant Reformation except that some kids in our neighbourhood were "protestants" which meant they went to a different church than us. But my dad explained things as needed, and my focus anyway was mainly on the main character who had the same name as me. The story of Saint Thomas More left a deep impression on me, leaving me perplexed and even disturbed. My father asked me what I thought about the story, and I remember asking him the same question. "I've always admired Thomas More," my father explained. "For me, he is a model of what it means to follow your conscience." "Conscience? What's that?" I asked. My dad did not answer the question directly. Instead of saying what it was, he said what it meant. "To live by your conscience means to always act according to the truth. That's what Thomas More did." I changed the focus of my questioning. "But why did Sir Thomas go all the way to being killed?" "He didn't want to die," my father explained. "If you noticed, Thomas was trying to avoid falling into the danger set before him. He didn't go looking for trouble, in fact he did his best to get out of it, but when in the end they backed him into a corner and said he had to deny his commitment or else, he refused to do so." "That's what conscience means," he continued. "To live by your conscience means you have to have courage. Anybody can find excuses to avoid challenges and suffering, but sometimes there are things we have to be willing to sacrifice for. For example, if someone ever made me have to choose between my life and yours, or my life and the life of your mother, or brother, or sister, I'd choose to die rather than let you die. At least I hope I would, I hope I'd have the courage to do that." Now that got my attention. My dad didn't know it, but he was teaching me about the difference between courage and daring. People will sometimes do something dangerous on a dare, but real courage is not just about daring. It is about daring to do the right thing, even if it costs you. This, of course, raised other questions in my mind. After all, if following your conscience could have such high stakes, you had better be pretty sure of what the right thing is. After all, there is no point suffering for the wrong thing! 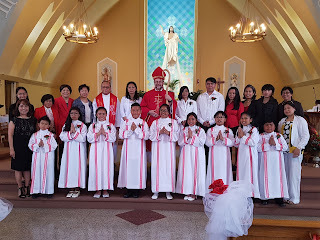 My father confirmed as much. "To follow your conscience takes courage, but you also have to use your brain," he said. "You have to always be willing to seek the truth and stick with it. But it also takes humility, because no one can ever know the whole truth all at once. You have to be willing to admit you don't know everything, and to be willing to ask questions. It helps to be part of a community that is committed to finding the truth and living it. That's what the Church is for." Getting back to my story, I remember asking my dad if all this conscience stuff was really worth it. Remember, I was a kid and peer pressure was a fact of life. If joining with my friends was the path of least resistance, why not just do that, at least in the normal course of life? My father reminded me that, in the film, Sir Thomas had a conversation with his good friend the Duke of Norfolk, who had tried to persuade Thomas to take a false oath "for fellowship". Thomas replied, "And when we die, and you are sent to heaven for doing your conscience, and I am sent to hell for not doing mine, will you come with me, for fellowship?" I looked at my father and said that this argument did not sound fair. God was going to punish us for not following our conscience? Is that the ultimate reason why we should seek the truth and be willing to suffer for it -- because we are afraid of God? With great patience, and with (I believe) some delight in the fact that I was pushing the issue so far, he replied that, in fact, having a strong conscience, one that was anchored in truth and had the courage to live it, was actually the source of one of the greatest assets a personality can have: inner freedom. Saint Thomas, in his struggle, showed himself to be more free than the King himself, even when he was locked up in the Tower of London. We need that inner freedom, my father explained, to be able to live according to the ultimate law: the law of love. I had heard of this law before, during the Bible readings and sermons and church, such as in the expression "love your neighbour". That law doesn't say we have to like our neighbour, but that we do have to love him. We have to even love our enemies. But, as my father explained, how can we do that unless we have the inner freedom to do so? Real love cannot be forced, it must be free. Having a strong conscience makes us free inside, the kind of freedom that Saint Thomas had to declare that he was "the King's faithful servant, but God's first". "That's why we wind up in Hell if we disobey our conscience," my father explained. "We can't live real love with out. And God is love, Heaven is love. It's not that God will punish us if we don't follow our conscience, it's that conscience is our guide to Heaven, to being with God. And while God sometimes grants people visions or speaks words to them, it's in our conscience that God ordinarily impresses himself up on. If our conscience isn't clear, we can't have a real relationship with Him." This conversation had a lasting effect upon me, even until today. For example, as I've gotten older I've come to realise this conversation was the start of my passion for ecumenical and inter-faith dialogue (heck, even dialogue with sincere atheists). I like speaking with people who have convictions and try and live by them. Our convictions may differ, but if those convictions are sincere it means the other person is willing to have them tested in the name of a higher principle, i.e. the principle that The Truth is more important than "this or that" truth. As I would learn later, this perspective would eventually come in handy when I started to have my own "crisis of faith" -- that that is a story for another time. Other articles quickly followed. I was interviewed by the CBC for one of them, and while the headline had the same emphasis, I found the article to be fair. A further Google search will reveal even more articles. I have not had a chance to read them all, but I've been pleased so far. This issue is too important, and I'm hoping these articles will help us not only advance our pilot project further, but help all community groups, Catholic or not, do what's right. For those interested in learning more about this emerging relationship, you should check out the landmark document Evangelicals and Catholics Together (sometimes called ECT). I got a message from my cousin Paul that his mother Louise (my aunt) passed away. 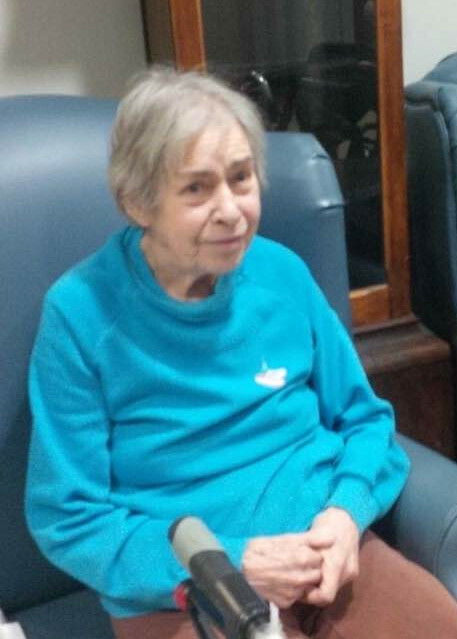 Condolences to her two sons, their spouses, her grandchildren and great-grandchildren. She was predeceased by her husband Bruce a little under a year ago. My siblings and I remember her kindness during many a visit to her home when I was young. She was suffering from dementia in recent years, so we kept those memories for her. Now she is with the Lord. May she rest in peace. UPDATE: Here is her obituary. Congratulations to Edwin and Nora! Congratulations to Edwin (baby on the left) and Nora (baby on the right), two cousins I had the honour of baptising today. I have known (some of) the families for many years now, and I've had the pleasure to get to meet even more. God bless to all, and welcome to God's family! Great video of the procession we had on the feast of Corpus Christ. Thousands of people wound through the streets of downtown Montreal, starting from Mary Queen of the World Cathedral and ending at Saint Patrick's basilica. God was good to us with the weather, too: the temperature was perfect, mild with a light breeze, and the rain held off until exactly the moment we made it back to our starting point. I'm already looking forward to next year. When you are a priest, you never know when you'll be called upon. There are things you can plan, such as a meeting I had in Toronto on June 13-14. But then there are things that are just surprises from God. 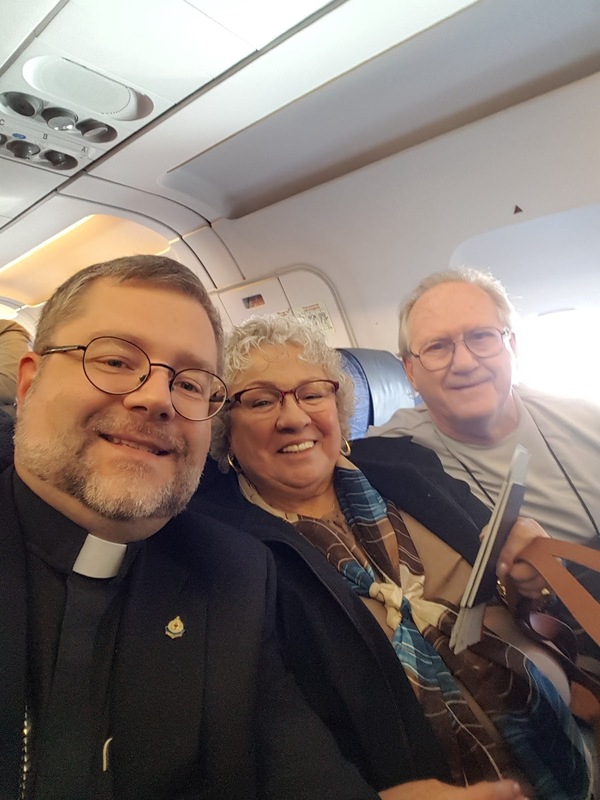 On my way back from Toronto I wound up sitting next to a lovely couple from Arizona who were on their way to Wabush in Labrador (quite a trip!). After some typical chit chat they asked me to pray with them for a member of their family who is sick. So the three of us, sharing row 16, leaned in and prayed. It was a lovely (and surprising) moment of ministry. God bless to them in their journeys. Our diocesan communications Director, Lucie Martineau, is retiring at the end of June. Today was our chance to honour her with a small cocktail (in French, a 5 à 7). It has been a real pleasure working with Lucie. She is a loyal woman of faith as well as a consummate professional. Her wisdom and experience have helped steer the diocese in some challenging situations. At the event to mark her retirement, Archbishop Lépine reminded us all that we may retire from our job, but we never retire from being missionary disciples. 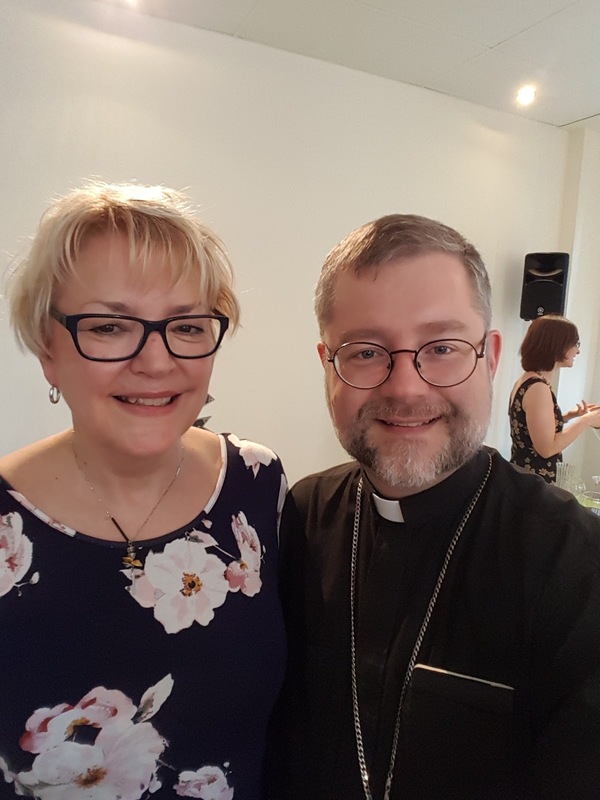 While she may no longer be working at the diocesan curia, I am sure Lucie will continue to carry the mission of the Church in her heart. Many thanks to you, Lucie, for all you have contributed to the welfare of the people of God and our greater society. What the heck is the Trinity? On this Sunday dedicated to the Holy Trinity, I thought I might share a presentation I gave a few years ago to students at Concordia University. Enjoy! 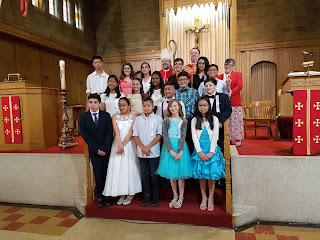 I had the real pleasure of presiding the mass of First Communion for the parishioners of my parish, Our Lady of Fatima. The kids were so excited and so into it. It was a real joy! I saw the new Wonder Woman movie. I was thoroughly entertained. It is definitely in my top three favourite super-hero themed films of all time. I don't know it if will achieve the number 1 spot (I'd rather wait and see how I feel about it some time down the road, after the initial exhilaration has worn off), but it has definitely de-throned my previous #1 favourite, The Dark Knight. You might be wondering, "If it de-throned your previous #1 favourite, how come you aren't willing to say this is your new #1 super-hero film?" The answer is because watching Wonder Woman made me realise that The Dark Knight was not really my favourite super-hero film, it was my favourite super-villain film. Batman was ok in that film, but the Joker was awesome, the greatest depiction of Nietzche's ubermann I have ever seen in any medium. What I loved about Wonder Woman, on the other hand, is that finally we have a DC film with an actual unambiguous hero (or, in this case, heroine). To date we've had an angsty Superman, a vengeful Batman, and a very silly Suicide Squad. Blech. But in the case of Wonder Woman, she just shone. As a matter of full disclosure, I should add that I am a geek. I have been for a long time. For example, I collected comic books as a teenager. Among those comic books was the reboot of Wonder Woman led by artist George Perez. The Wonder Woman character had gone through a few incarnations, including the campy 1970's show starring Linda Carter, but Perez brought the character back to her Greek roots. She was not defined by the name Wonder Woman -- that was what others called her. She was Diana, warrior Amazon princess, come to man's world to chew bubble gum and kick a** (and she was all out of bubble gum -- bonus points if you get the reference). As the character's story arc evolved, the god Ares emerged as her key adversary. This was one scary dude, the personification of war itself -- not a god of strategy and victory, but a god who revelled in conflict, bloodshed, and even bloodlust itself. Yikes. I've heard some complaints that the movie is too long, or that the final act is too convoluted. Nonsense. The plot and writing are generally pretty tight, with one exception (how can Zeus have created Diana if he was previously killed by Ares? ), but more important is how Diana has to confront not only the specific evil she has come to fight, but also the evils created by the simple misuse of free will (which, the movie reveals, are considerable). She even needs to confront herself, in a way. In other words, the character grows. Wonder Woman is not just an origin story, it is a "hero's journey" story, only she is going from someone already heroic to a more mature hero. Not easy to pull off in a compelling way, but it happens. Kudos to the writers. Ares does make his eventual appearance, showing himself to be a master of deceit and temptation more than just a bad guy who makes things go boom. Yes, there is a final battle, but this is literally a battle between figures from mythological Greece -- people should read some Homer and then see if they want to come back and complain about the final act. And we should also realise that the villain, while named Ares, is really a depiction of Satan -- there is even a scene where Ares and Wonder Woman are speaking in a garden paradise, with Ares trying to tempt her, meaning that Wonder Woman is actually an Eve-like figure. If you don't know the stories you might not pick up on details like that, because the film is subtle about it. I like that. I am getting pretty tired of seeing films where the supposed catharsis comes through vengeance. In this film, while the main character initially believes, in her naiveté, that her problem can be solved by wrath, in the end it is love that gives her the strength she needs. That's powerful. I think the film could have been improved by a greater exploration of what love actually means (in our day, romantic love is often assumed to be the highest form, a falsehood which does nonetheless find an echo in the film). Still, I do recognize that in the end it's a super-hero movie that has an audience to please. For what it is, the film is well written, well acted, entertaining, and even meaningful. Definitely worth my time, and I'm sure I'll be seeing it again. Whatever happened to the Pentecost octave? I was chatting with a brother priest at lunchtime, and somehow we got on the subject of part of our liturgical tradition: the Pentecost Octave. What is an "octave", you ask? This is a custom of celebrating a particularly important feast for a period of 8 days. In other words, the feast in question doesn't just get a feast *day*, it gets a feast *week*. An example is Easter, which is celebrated on a particular Sunday, but which continues in its celebration for the week afterwards. Even in secular parlance people are familiar with the notion of "Easter Monday". This expression doesn't just mean the Monday after Easter, it is referring to the idea that the Monday actually *is* Easter, prolonged! The post Vatican II calendar has 2 octaves: Easter (already mentioned, which goes until Divine Mercy Sunday), and Christmas (which stretches until January 1, the feast of Mary, Mother of God). The older calendar also had an octave for Pentecost, however, which went until Trinity Sunday. For some reason this got dropped, so that the week between the two Sundays is simply a week in what we call "ordinary time". I never grew up with this tradition, so I guess I don't miss it in any experiential way, but I must admit I do wonder why it was dropped and what we might be missing. On a theological level, the Latin church is often accused of neglecting what we call "pneumatology", i.e. the theology of the Holy Spirit. Surely a week dedicated to the Holy Spirit would help in that regard! On a pastoral level, there is something to be said for having a week dedicated to helping people be open to the Holy Spirit in order to better encounter Christ. We Catholics are discovering more and more that individual dedication to Christ, while at the heart of faith, needs to be completed by a personal, heart to heart encounter with Christ. The thing is, we can help people experience the former by means of reason (perhaps why we are more comfortable with it as an approach), but the latter can only be done via a gift of pure grace (and hence is, to a certain degree, out of our control). It is the Holy Spirit alone who permits the personal encounter with Christ, and so our New Evangelization will require a pastorale de l'Esprit Saint, i.e. a pastoral approach with the Holy Spirit being presented and proposed as the key protagonist of our relationship with Christ. Today is the feast of Pentecost, and I had the pleasure of visiting Our Lady of the Philippines Mission to offer the sacrament of confirmation to 9 children and 3 adults. The welcome was warm as only people of the Filipino culture can do, the ceremony was full of life, and the meal afterwards was delicious! Bring on the lechon! 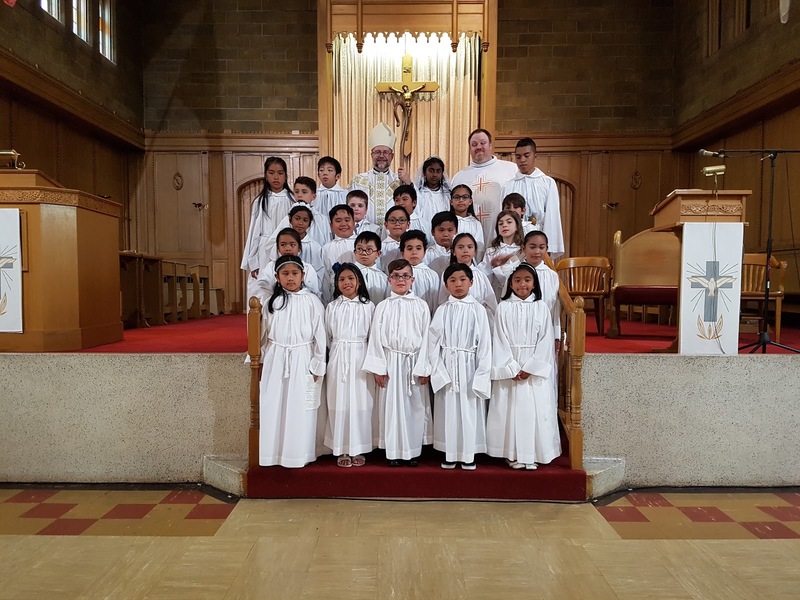 Many thanks to Father Frank Alvarez, as well as the team of catechists, who joined in the picture you see above (click on it to expand). Congratulations to you! As a bishop I have the chance to celebrate confirmations in many different places. Tonight, however, I had the joy of presiding confirmation in the parish where I am pastor (Our Lady of Fatima). I was so proud of those young people! And they were really good, participating well (reading and singing) and answering my questions at the homily. May their lives be filled with the Holy Spirit always! I bought a new computer a couple of days ago: an Acer Spin 5 laptop. I haven't bought a new computer for at least 10 years now, because up until now I've been taking old PC's and recycling them by installing Linux Mint. I love Linux, I really do, but with all the travelling I've been doing I really needed a better machine to actually get my work done. The laptop arrived yesterday, and I had a chance to set it up today and take in for a... um... spin! The verdict: wow, this thing is fast! It boots fast, it runs software fast, and the connection speed is great (must be using a more advanced Wifi protocol than my current machine). Frankly, all of this makes it more fun to use. My plan is to keep this laptop free of all kinds of downloaded crud. A clean software always feels great, like that fresh sensation after you've brushed your teeth (yes, I know I am a geek). I'm still going to keep my desktop as a backup development machine, but for now I'm enjoying this one.